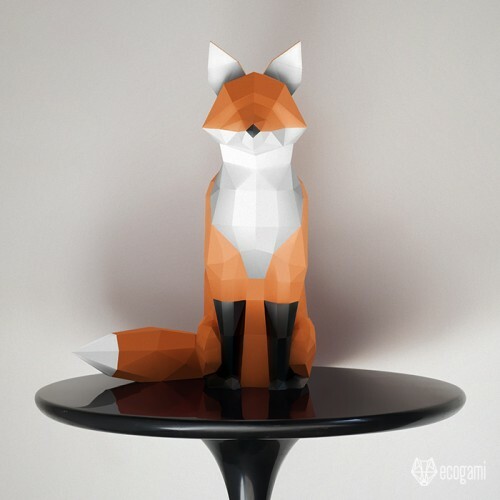 Make your own paper fox sculpture with our PDF pattern! It’s easy! Just follow the instructions & you will be proud of your low poly wild animal. Isn’t it a nice object for your sweet home or even a gift for an animal lover? Don’t be afraid, I assembled the sculpture, so everybody can do it! You will just need time & precision. Put your music on & enjoy the assemblage! (For me it is a perfect way to relax). ► Once purchased, download the ZIP file with the pattern (PDF files to be printed with A4 or A3 sheets – Letter or Tabloid in the States) & the complete instructions in English to make the sculpture. ► Print the template (choose the sheet format which is more convenient for you, the size of the sculpture is the same with A3 or A4 paper). The paper must be thick (200 / 300 GSM / grams per square meters). The one I use is 270 GSM & it is perfect for that kind of sculpture. You can print at home if you have a printer or, easier, go to the nearest Print shop, you could buy the paper & print there. ► You have the printed pattern! Now just check you have the following tools: a pair of scissors, a ruler, white paper glue and a tool to fold the paper (could be a scoring tool / cutter pencil or even a small knife). You are ready to begin! ► Now just follow the instructions: cut the parts, fold & glue them. It is easy, all the parts of the pattern are identified with edge number guide for easy assembly (to assemble the papercraft model just match the numbers on the edges with the corresponding number & glue the edges together). ► Once finished, you can customize the sculpture according to your taste. The customization options are infinite! You can color each face with felt-tip pens to make it multi-colors (I did it for several models). Or, you can paint it to make it stronger & easier to be cleaned. With an oil paint or even spray paint, it will look like laminated & your friends won’t believe you made it with paper! ► Difficulty Level: Medium – Few small parts (muzzle / feet) but nothing unsurmountable with precision and patience! Total or partial reproduction of the contents of this site is forbidden.